One interesting fact about the Tom Swift series is that it inspired a TV show. 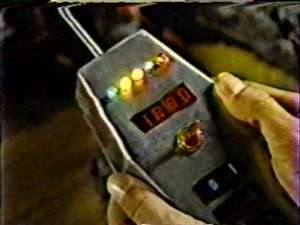 During the early 1980's an attempt was made to create a Tom Swift/Linda Craig TV series, and one pilot show was made. The show was only shown once, on a Sunday afternoon, and since it had dismal ratings the series was cancelled. Some believe that the series was cancelled before the first show was broadcast, for why else would it only be shown once at that time slot with no advertising and only limited nationwide coverage? I don't claim to be an expert on this show; if you want to know more about it you can visit other Tom Swift websites, where it is discussed in more detail. However, I do have a copy of the pilot and I've watched it and I have a few observations. The show itself is really bad, not only as a Tom Swift TV show but even as an ordinary TV show. There is a Tom Swift inventor character, but he's a highschool kid who won a science fair prize for inventing a carbon dater. There is no Enterprise, no Chow, no Bud, no Challenger, no evil Brungarian spies. The plot involves a search for a kidnapped man and a long-missing treasure. I don't want to say a lot more because I don't want to spoil the story, but it's not a very good effort. It is really a tragedy! They had such great material to work with: think of all the gadgets and scenarios that Enterprise had to offer! All they could do is come up with a hunt for buried treasure? What about the Brungarians? What about the Space Friends? What about alien artifacts from the distant past? What about cool new gadgets? It's a pity. When you contact him, just ask for the Tom Swift TV Pilot. The guy in the middle is Tom Swift, a highschool student who is showing off his latest invention (a machine that can instantly carbon-date something with outstanding accuracy). To his right is Linda Craig. 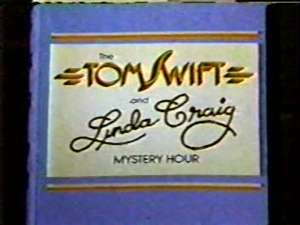 This show really should have been called the Linda Craig / Tom Swift Mystery Hour; Tom was really a fairly minor player. This is a picture of Tom's carbon dater in action. It identified a wooden wheel Tom pulled out of the ocean as being made in 1880, meaning it was a hundred years old. Imagine that: the wooden wheel lasted a hundred years in the ocean surf and was still almost as good as new. In the show Tom was disappointed that it wasn't older. Another shot of Tom Swift and Linda Craig, hot on the case of a missing relative. Tom Swift and Linda Craig, trying to persuade two of their friends to go off on a wild-goose-chase. He was successful.